HDD mud recycling and mixing unit is one of our main applications, we can provide both standard design mud system or customized mud system for different storage, mixing and recycling requirement. 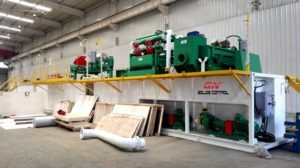 For standard design mud recycling system, we have 200gpm, 350gpm, 500gpm, 1000gpm treating capacity mud system, with multi function of storage, mixing, recycling. We have economic configuration type desander unit and self contained mud recycling system for option. Economic configuration desander unit is normally used for TBM and piling, without mixing and storage capacity, desander unit is only used for recycling. We have 200gpm, 500 gpm and 1000 gpm desander unit for option with compact design. 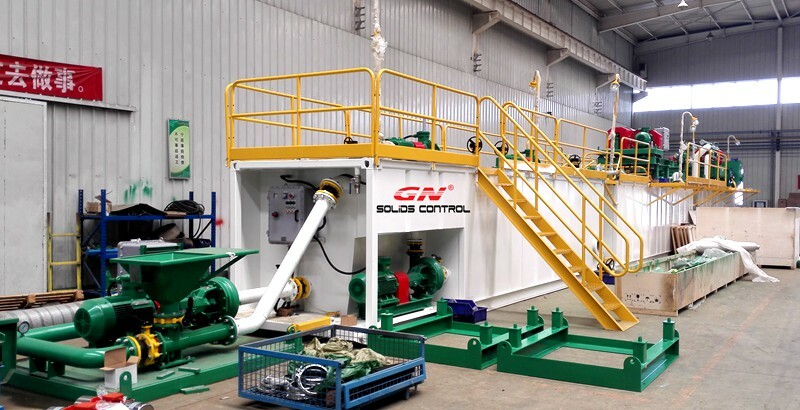 This week GN solids control shipped 2 units of chemical dosing system with 2 big bowl big volume decanter centrifuge to our Singapore Clients for TBM waste mud treatment. 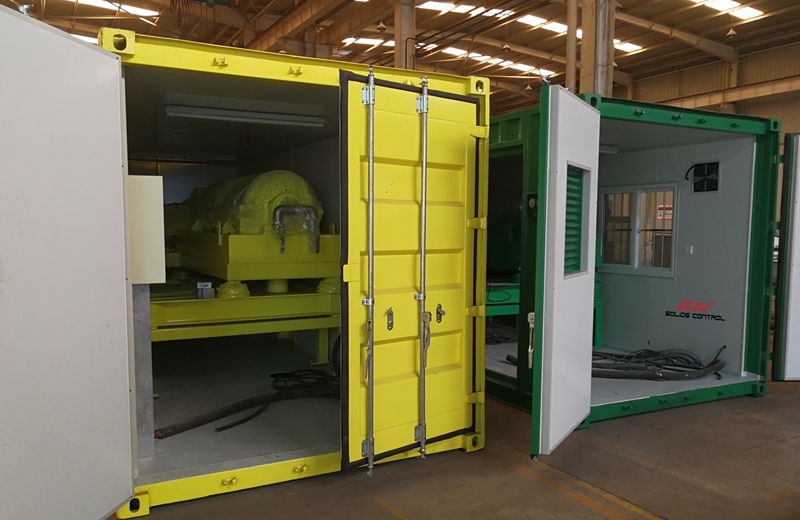 This is not the first time for GN to ship such dewatering unit to Singapore for TBM waste water treatment project, several years ago we shipped another unit of containerized dewatering unit with decanter centrifuge installed inside 20ft container for convenient shipment, operation and rain proof. GNLW553C-VFD decanter centrifuge is a 22 inch bowl diameter centrifuge, this is not the largest centrifuge GN can produce, we also have GNLW764-VFD with 30 inch bowl diameter centrifuge, it can be used for Tunneling project when huge amount water/ sludge is required for the operation. The chemicals are added in the chemical dosing system and mixed, then the dosing pump will transfer the chemicals to the decanter centrifuge feed tube, the chemicals will be added to the waste water/ waste sludge from the TBM and after treatment, the ultra fine solids will be separated out from the waste water so they can be reused for the TBM operation. The centrifuge mechanical separation cut point is 2~5 microns, if most of the solids inside the waste water is smaller than 2 microns, it is hard to separate out them, you have to add flocculant to make them flocculation and easy to be separated by the high speed decanter centrifuge. The max rotary speed of the decanter centrifuge is 2500rpm, it can be adjusted by the VFD control panel with PLC smart control. 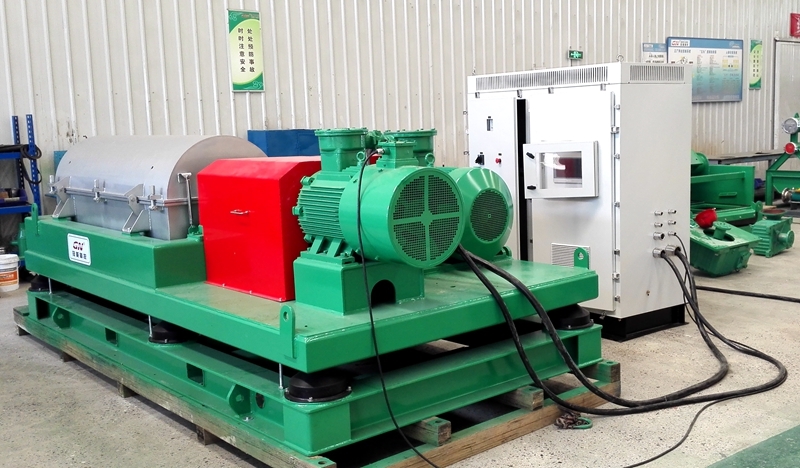 The normal operation speed is 2200rpm. 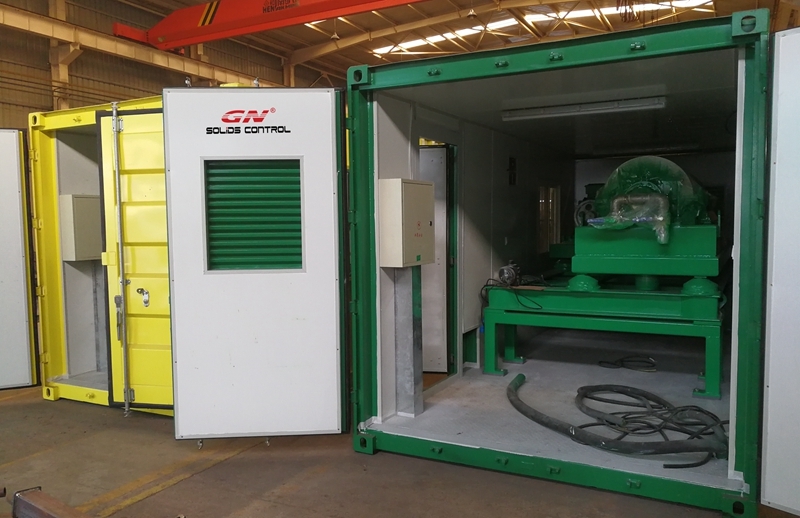 The dewatering unit /chemical dosing system are installed inside 20ft container for convenient operation, maintenance, and rain/ sun proof. GN solids control showed our Piling & TBM desander unit and GNLW223 mining centrifuge at no-dig show held in Beijing, China last week, the exhibition full name is 2016 China international Trenchless Technology Conference , which is held in on Oct. 10~ 12th, 2016 at the Agriculture Exhibition Hall in Beijing. Our stand No. 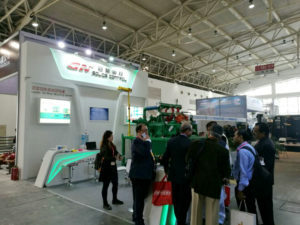 is 128, which is next to Famous brand HDD machine manufacturer Goodeng and Vermeer. The treating capacity is 50m3/h with compact design for transportation. 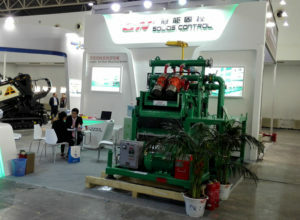 The Desander unit is composed of double deck shale shaker with 4 units of desilter cone, the separation cut point is 20 microns, desilter feeding pump, catching tank, pipelines, lighting, electric control system, handrail, stairs, etc. The desander unit can be applied to bored piles, Tunneling, small HDD projects. Normally we called it economic mud recycling system, sometimes clients will use a storage tank and a mixing hopper together; to make all the equipments as skid mounted mud recycling system, we called it self-contained mud recycling system with recycling, mixing, storage triple functions. It has been widely used for mining diamond core drilling waste water recycling, the purpose is to reduce the water consumption, reduce the solids disposal cost, reduce the total drilling cost to save money for the client. The max speed for the mini centrifuge is up to 5000rpm. Recently GN solids control start to apply our decanter centrifuge for industries except for oil & gas drilling, constructions industry, for example, industry waste water treatment, oil tank bottom cleaning, solids waste treatment, etc. GNLW553C-VFD big bowl decanter centrifuge with dosing system can be used for industry waste water treatment. We have 3 models decanter centrifuges can be used together with dosing system. GNLW363CG-VFD is with 14inch bowl decanter centrifuge, which is the most popular model. GNLW453C-VFD is the 18 inch bowl decanter centrifuge, it is the middle model. GNLW553C-VFD is with 22 inch diameter big bowl which is the biggest model decanter centrifuge. 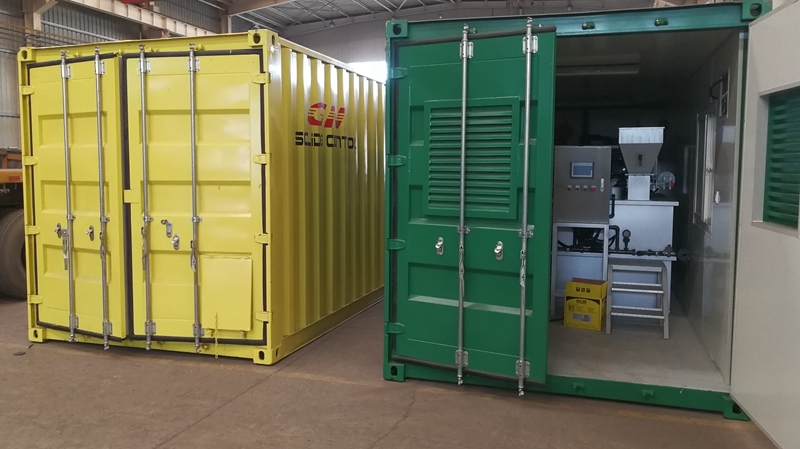 The dosing system is installed inside a 20ft container, with lights, windows, doors, air conditioner, etc, for convenient operation and transportation. 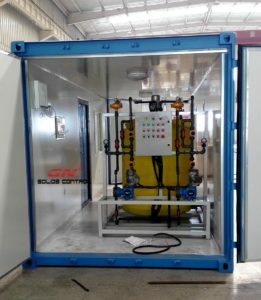 To reduce the total cost of the dosing system, the dosing system with only a polyurethane material mixing tank and 2 dosing pump with electric control panel. 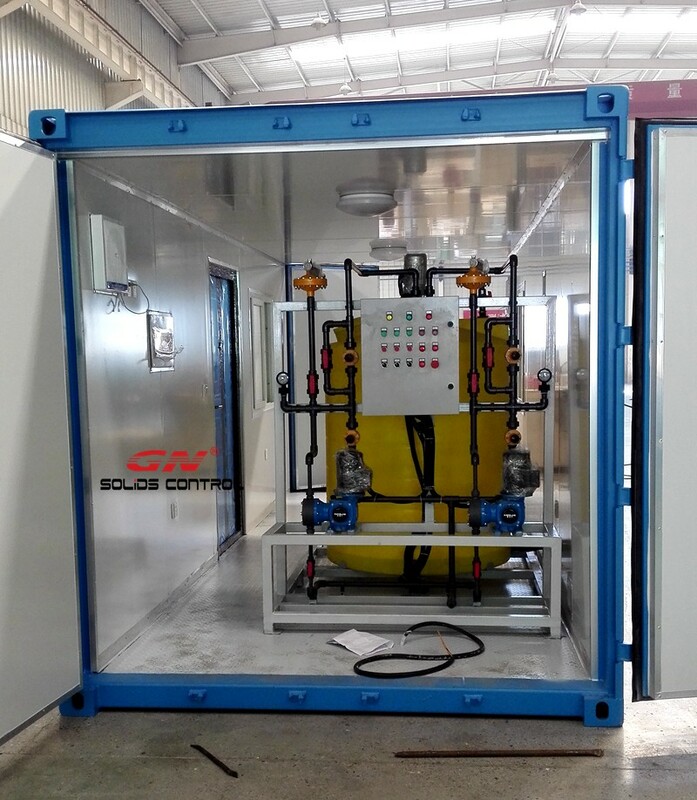 The VFD control panel is not same configuration with oilfield explosion proof VFD control panel, it is a low cost special designed for non explosion proof applications, for example, TBM, dredging slurry separation, sewage water treatment, etc. The non exploson proof VFD control panel is also PLC smart control and touch screen, but the cover is not full of stainless steel material.